As the summer winds down (sigh), it's great to find recipes that can be made in a flash. Weeknights are a busy time, so getting a good, healthy dinner on the table as quickly as possible can be a challenge. Not so with this fish! Just like many of the other fish recipes here, this one comes is fast, fast, fast, ensuring a relaxing dinner hour, with plenty of time to enjoy what you made! 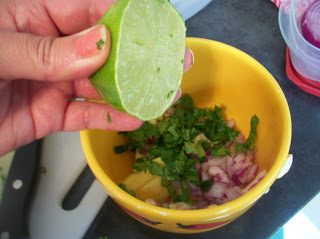 And with the fruity salsa, this dish will remind you of summer days, even on the coldest winter day. and salt in a small bowl. Heat a large nonstick skillet over medium-high heat. Add oil to pan; swirl to coat. 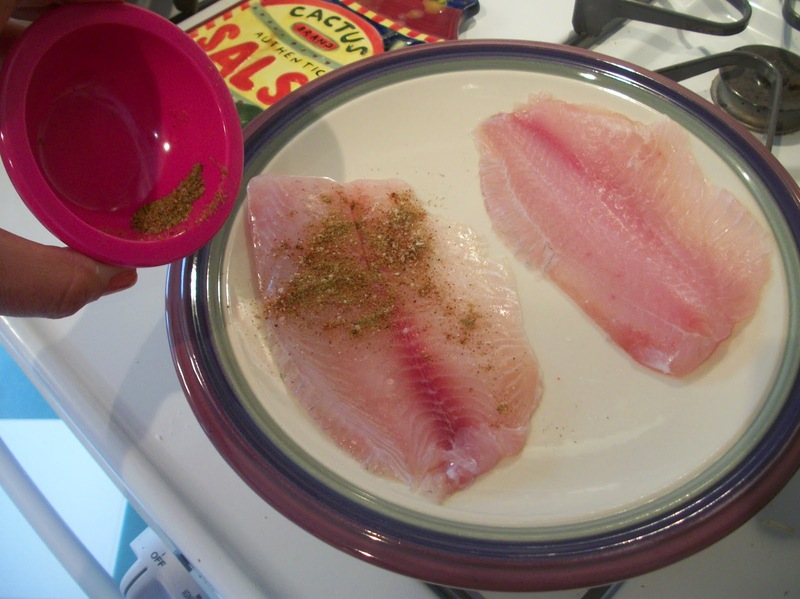 Sprinkle fish with cumin and chili powder. or until fish flakes easily when tested with a fork. 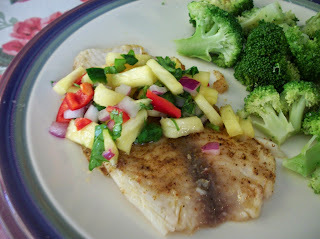 Spoon pineapple salsa over fish. Find more great ideas at Full Plate Thursday, Showcase Your Talent, Pennywise Platter. 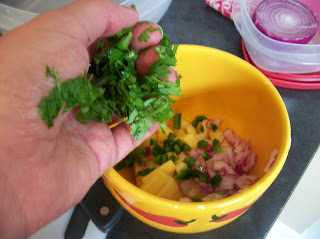 Combine pineapple, red onion, jalapeño, red pepper, cilantro, lime juice, and salt in a small bowl. Heat a large nonstick skillet over medium-high heat. Add oil to pan; swirl to coat. Sprinkle fish with cumin and chili powder. 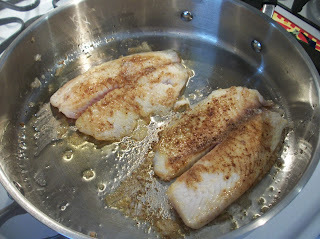 Add fish to pan; cook 3 minutes on each side or until fish flakes easily when tested with a fork. 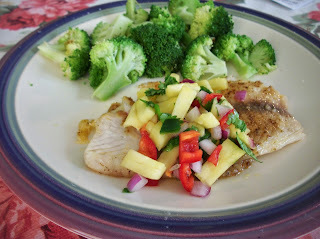 Spoon pineapple salsa over fish. I simply love a well prepared piece of Tilapia. This looks absolutely delicious. Your Tilapia with Pineapple Salsa looks delicious! Thanks so much for sharing your awesome recipe with Full Plate Thursday and have a great weekend.